Elder brother of Herod the Great. Both Phasael and Herod began their careers under their father, Antipater, who appointed the former to be governor of Jerusalem, and Herod governor of Galilee (Josephus, "Ant." xiv. 9, § 2; "B. J." i. 10, § 4). While Antony was in Bithynia about 41 B.C., accusations were brought before him against the two brothers, who were objects of hatred to the Jewish party, but the shrewd Herod succeeded in obtaining the dismissal of the charges ("Ant." xiv. 12, § 2; "B. J." i. 12, § 4). It was impossible, however, for the elders of the Jews to rest content with the administrations of Herod and Phasael; and charges were again brought against them before Antony at Antioch. Once more the accusations proved to be fruitless, for Antony was indebted to Antipater, while even the weak Hyrcanus II. pleaded for them; so that Antony appointed them tetrarchs ("Ant." xiv. 13, § 1; "B. J." i. 12, § 5). Meanwhile the Hasmonean Antigonus endeavored to seize the Jewish throne; and in Jerusalem there were frequent conflicts between his retainers and those of the two brothers, which were especially perilous on the Jewish Feast of Pentecost. 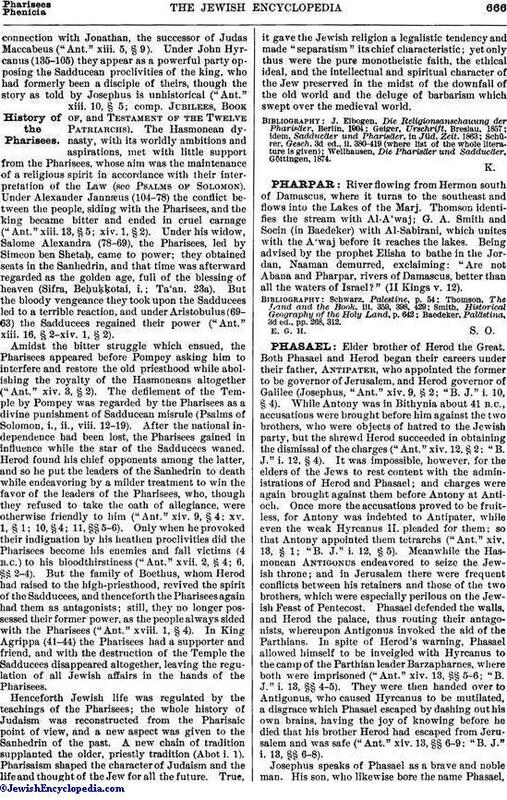 Phasael defended the walls, and Herod the palace, thus routing their antagonists, whereupon Antigonus invoked the aid of the Parthians. In spite of Herod's warning, Phasael allowed himself to be inveigled with Hyreanus to the camp of the Parthian leader Barzapharnes, where both were imprisoned ("Ant." xiv. 13, §§ 5-6; "B. J." i. 13, §§ 4-5). They were then handed over to Antigonus, who caused Hyrcanus to be mutilated, a disgrace which Phasael escaped by dashing out his own brains, having the joy of knowing before he died that his brother Herod had escaped from Jerusalem and was safe ("Ant." xiv. 13, §§ 6-9; "B. J." i. 13, §§ 6-8). Josephus speaks of Phasael as a brave and noble man. His son, who likewise bore the name Phasael,and seems to have been posthumous, married Herod's daughter Salampsio, by whom he had five children ("Ant." xviii. 5, § 4; according to "B. J." i. 28, § 6, the elder Phasael was the husband of this Salampsio). 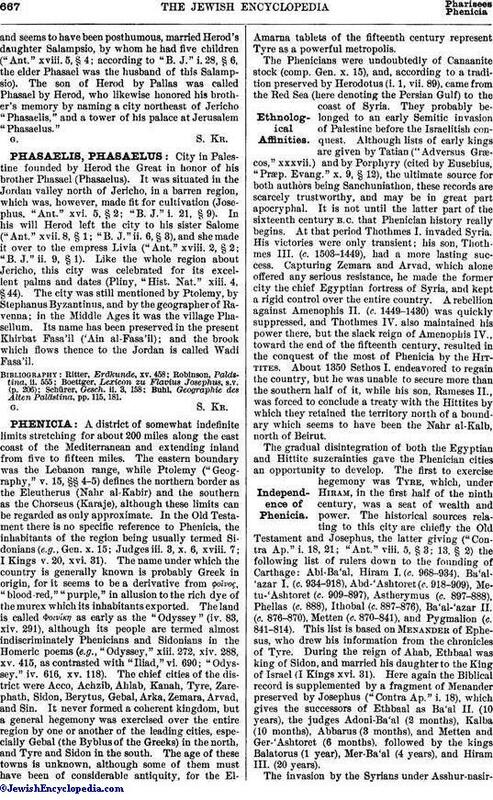 The son of Herod by Pallas was called Phasael by Herod, who likewise honored his brother's memory by naming a city northeast of Jericho "Phasaelis," and a tower of his palace at Jerusalem "Phasaelus."